Wubi is a tool that installs Ubuntu on our hard drive without having to do almost anything. Just click and wait. 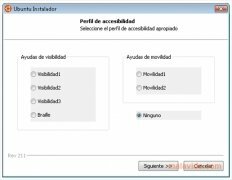 Wubi leaves Windows completely intact, and it doesn't modify our PC's partitions nor does it install any additional drivers. 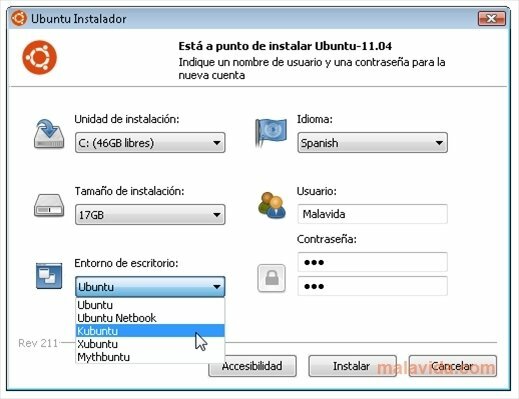 It only adds the additional option to launch the system as Ubuntu, in such a way that at any moment we will be able to launch it as Microsoft Windows if we want, without it being affected by the fact that we have an Ubuntu folder. Wubi is specially designed so that Ubuntu works as any other application that we have installed on our system. 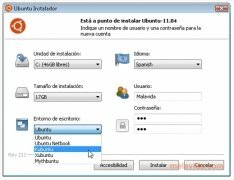 It stores the majority of its files in a single folder, in such a way that, even if despite all its good things, Ubuntu doesn't convince us, we can easily uninstall it like with any other program, without our Windows being affected at all. Logically, it is an open source application. When we launch Wubi a small window will appear in which we will have to indicate in which disc unit we want to perform the installation, the size of the hard drive, our language, user name and password, as well as the desktop environment that we prefer, being able to choose between Ubuntu, Kubuntu, Xubuntu and Mythbuntu.